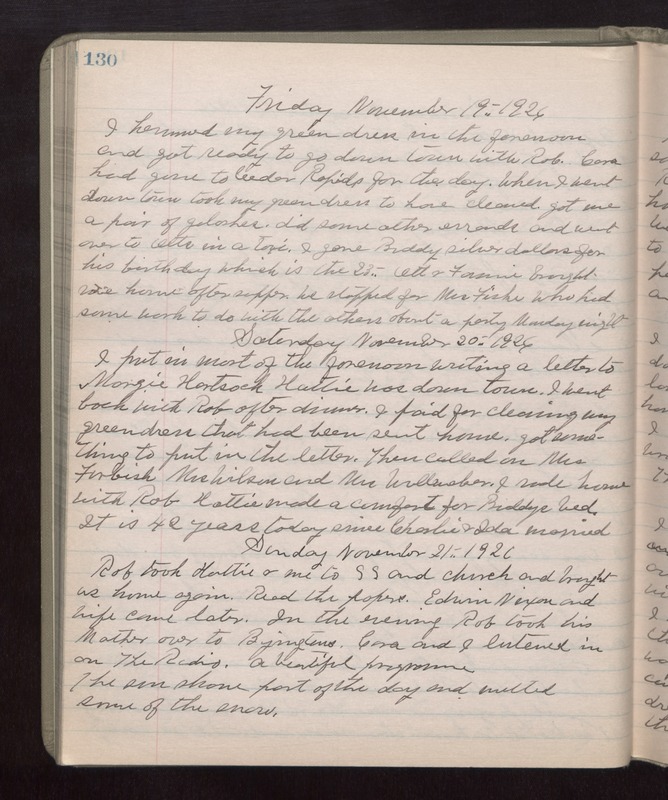 Friday November 19th 1926 I hemmed my green dress in the forenoon and got ready to go down town with Rob. Cora had gone to Cedar Rapids for the day. When I went down town took my green dress to have cleaned, got me a pair of galoshes, did some other errands and went over to Otts in a taxi. I gave Buddy silver dollars for his birthday which is the 23rd. Ott & Fannie brought me home after supper. We stopped for Mrs Fiske who had some work to do with the others about a party Monday night. Saturday November 20th 1926 I put in most of the forenoon writing a letter to Margie Hartsock. Hattie was down town. I went back with Rob after dinner. I paid for cleaning my green dress that had been sent home. Got something to put in the letter. Then called on Mrs Furbish, Mrs Wilson and Mrs Wullmaber. I rode home with Rob. Hattie made a comfort for Buddys bed. It is 42 years today since Charlie & Ida married. Sunday November 21st 1926 Rob took Hattie & me to S S and church and brought us home again. Read the papers. Edwin Nixon and wife came later. In the evening Rob took his Mother over to Byingtons. Cora and I listened in on The Radio. a beautiful programme. The sun shoe part of the day and melted some of the snow.